Modern Debt Jubilee: Past, Present and Future of GDP Growth in the UK. This post was inspired by one by Mark Thomas: Does This Ease Your Worries? : US GDP from 1870-2008 where he shows that USA is getting back on trend for GDP growth. In the UK things look very different and so no, it doesn't ease my worries. The Guardian conveniently provide a spread sheet of all the GDP figures from 1955--Q2 2012. Below is a plain graph of quarterly GDP figures with an exponential trend line courtesy of Excel. What the graph shows however is that the trend overall is exponential growth - a shallow exponential curve, but with an R2 value of 0.9917 the fit of the line is very good. There were ups and downs but basically we got back to trend until the global economic crisis. 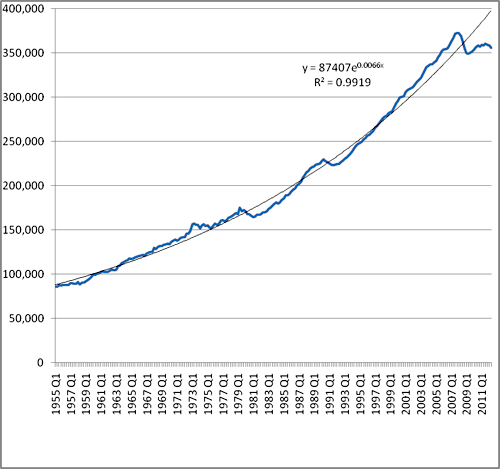 If we graph from 1955-1997 an exponential line is still the best fit, though the R2 value is less at 0.9873. Thatcher (1979-1990) inherited a recession and a period of below trend growth from Callaghan (1976-79) though the problem probably dates from earlier - witness the hiccough in 1973 that was followed by several years of stagnation. When Thatcher handed on to Major (1990-1997) things were picking up, but recession and below trend growth followed. And as Blair took over in 1997 growth had returned to trend and growth was about 1% per quarter. It had been a turbulent few years since the early seventies and the collapse of the Gold Standard, the end of the Bretton Woods agreement, and the UK's Competition & Credit Control Act. Now things seemed to be looking up. After 1997 growth in GDP began to accelerate, rising above trend at an increasing rate. However growth in this period is more accurately described as linear (R2 = 0.9974) rather than exponential (R2 = 0.9965). Clearly we got a long way ahead of the trend of the previous 43 years, further ahead than any previous period. This was Gordon Brown's economic miracle. In fact the period of above trend growth (1997-2008) is the debt bubble caused by New Labour's deregulation of the finance industry. It caused a sustained period of GDP growth which Gordon Brown called "the end of boom and bust". 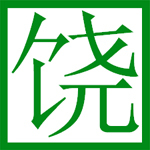 It was part of a global phenomenon. In the USA they called it "the Great Moderation". However in 2008 it all came tumbling down. With GDP still shrinking we are unlikely to ever get back to the pre-crash trend. Having risen about 6% or £25 billion above the trend by 2008, today, four years later we are about 12% or £47 billion below trend (and remembering that these are quarterly figures). In pre-1997 terms we've lost 35 quarters or nearly 9 years of growth and counting. I actually lean to the left in politics and I think the present Chancellor is a moron. 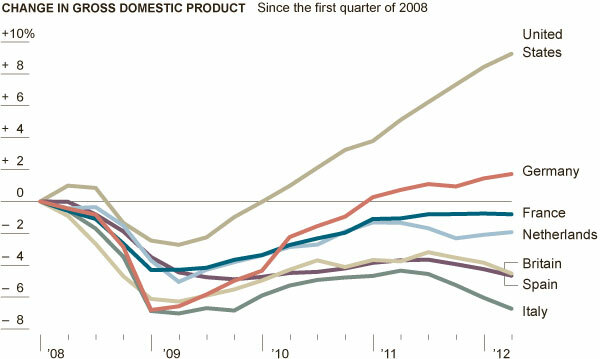 His legacy will be the extension of the worst recession in modern times as the graph from the NYT shows. The UK has been mismanaged. The USA is about to head back down unfortunately and German is likely to be devastated by the breakup of the Euro if they don't act soon. That said our part in the global financial crisis was facilitated by the New Labour government with Gordon Brown as chancellor. He didn't end boom and bust, he increased it by an order of magnitude! There are a couple of key differences between the USA and UK trends. In the UK we had no great perturbation of GDP in the Great Depression. For the UK the post-World War One recession was much worse. And whereas we see in the graph above the USA returning to growth, albeit possibly weakening, in the UK we started up and faltered. We're now so far off trend that we probably will never get back. When economists say that this recession is different they do mean that it is both qualitatively and quantitatively different. What is happening now is unique in the post-War period and we're unlikely ever to make up those nine years. In previous recessions the economy has always bounced back and got back on track. Not this time. 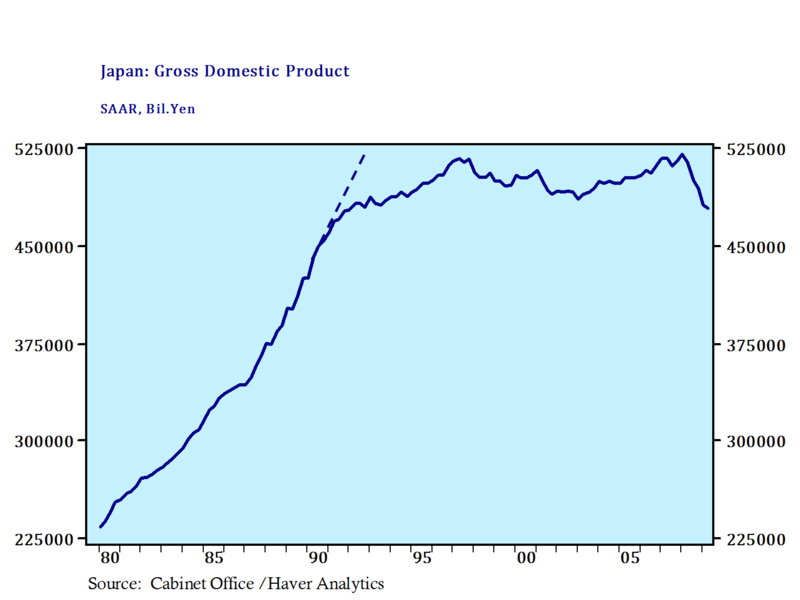 Below is Japan's GDP Curve (from http://professorpinch.wordpress.com/). This is going to be the shape our the UK's GDP curve now. Basically an extended period of stagnation at best. All those predictions of a return to growth? Just forget it. The game has changed. And the difference is levels of private debt.The USA and Germany are further ahead because they have half the level of private debt that the UK has. In political terms I don't see anyone really getting to grips with this, so we'll just have to ride it out. A lots decade looks optimistic given our political leadership at present. You are bang on Jayarava. The idea that the UK government is doing any austerity is simply wrong. Government spending has been the biggest contributor to GDP growth over the last few years. Look at the figures. The UK government cannot solve the UK's economic problems by spending a bit more or less money. The issue is that the UK private sector is the most indebted in the world. There has to be a massive private sector deleveraging in the private and financial sectors chiefly. The UK faces decades of no growth unless is deals with this. I think as you do there needs to be some sort of debt write off and a 50% fall in the housing for the UK to be able to recover. The main reason the US has had much more growth in the last 4 years is that firstly it's private debt was never as bad as the UK, house prices have fallen considerably and people have been able to in reasonable numbers walk away from their debts. The US has not resumed growth because of government spending. If you look at the total US government sector (state and federal) there has been considerable austerity mainly at the state level. The UK can either deleverage slowly over decades or do it quickly via a asset price crash and massive debt write offs. The former path is better for those over 50, the latter path is better for those under 40. And here we get to the crux. Political power is getting greyer and greyer. We can expect the government to fight tooth and nail to take the former path of a slow multi-decade deleverage. This is a war between the generations. And the grey generation holds all the aces.